www.spyderclub.com • View topic - UK 550 Spyder: which one? I'm currently weighing up my options in regards to the purchase of a 550 spyder replica (early next year) that hopefully I'll be building myself..
A) who makes 550 kits in the UK? I'm only aware of Martin and Walker, are there any others? B) which replica has he closest body shape to an original 550? 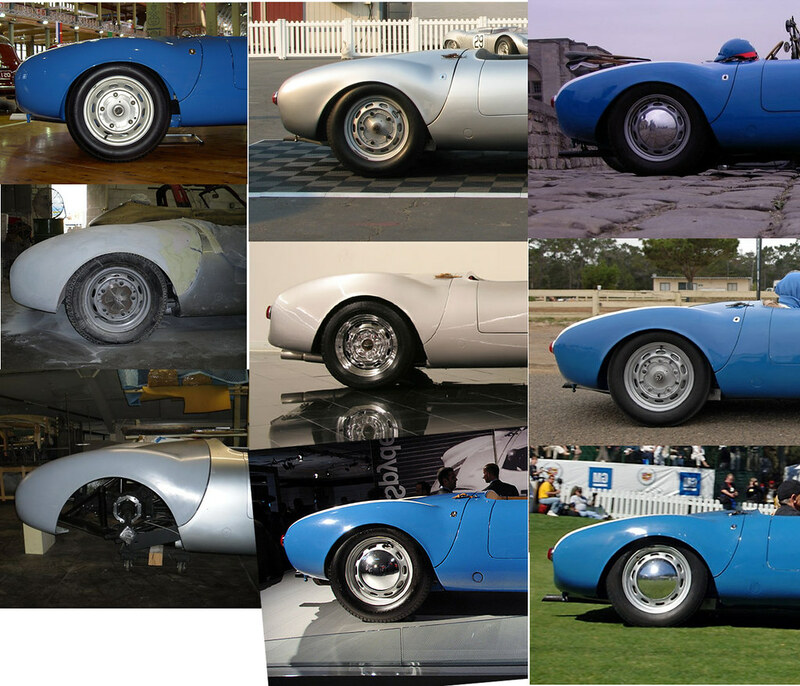 Re: UK 550 Spyder: which one? I think the Chamonix is slightly closer to the original shape than the M&W although both have been stretched to make the body fit the VW running gear. The Chamonix has the advantage of having a couple of suppliers working on 'corrected' rear decklids which are very inaccurate on virtually all the GRP replicas. If you want a really accurate car and have the cash Russ Rodriguez at Fibersteel is making a continuation of the CMI cars in GRP with corrected rear deck. The cars are dimensionally correct ie slightly smaller than the usual replicas and the fittings are very close reproductions of the originals. The cars are reasonably priced considering they are so accurate. sell kits? Thanks for the response. are wrong, what exactly is it thats wrong wrong with them? I understand what you're saying about the differences. I was of the same mind when when I first bought my kit, but got over it and now just love the car for what it is. The lower, slimmer rear wings on the original cars do look better though. Here's a pic of my M&W 550 next to an original 550A (the 550A was a later model with the carb doors, headrests and lower rear vents.). It's not quite comparing like for like (a few of the original 550's had slightly different shape rear wings anyway), but you can see the obvious differences here. Hey thanks for he offer, I'm not in a position to make a purchase until next year sadly. Thanks anyway. Your right it almost certainly something I'll get over, given the lack of choice in the UK ill have to! Nice car btw. I'm not trying to fool anyone, it's just I like to do things properly, I speak as a perfectionist. I don't want to buy kit 'A' only to find I could have bought a more accurate kit 'B' its just a question of spending my money in the right place. &1, you are correct as far as others already knowing that our cars are replicas or not noticing the differences. My problem was that I noticed it, every time, and from every angle! It is a rear-ended car that was fixed up by someone who did not know how to fix the car or did not care that it still looked like it was rear-ended. The back of the car is pushed up and into the firewall, deforming the rear wheel arches and causing the rear fenders to look more like a Cobra than the Spyder. It is the attention to details like this that some of us are afflicted with, which causes us to not enjoy things unless they are as close to perfect as possible (whatever that means) in our own eyes. For me it is not hard to see the problem in the image below. To others, all these cars might look alike (the one in the middle is a replica). If you don't see the difference loud and clear you will live a happier, healthier life. By the way, speaking of attention to detail, your car looks AMAZING! it is the best looking 356 I have ever seen, original, original-looking, or not. I am a huge fan. Absolutely beautiful. I am also putting my M&W on the market, but no rush to sell. Im based in Northern Ireland and will be selling 550 kits towards the end of this year. I've bought the jigs and moulds for the Sammio 550 and now currently developing the bodywork and the chassis to a higher standard and progressing towards a demo model. It will be in GRP - not aluminium.